→Is the Life Fitness X3 Elliptical Cross Trainer Worth the Money? Up until recently, these trainers were only found in gyms and fitness centers, but now, many people are installing them at home. Life Fitness have been producing quality exercise machines for both commercial and home use since the 1960s. But is it worth it? Let’s take a closer look to find out! If you are in a hurry and you want to find out more about Life Fitness’ latest offers and deals just click the link here. Alternatively, you can click on an item in the Table of Contents below or continue to read the entire article. 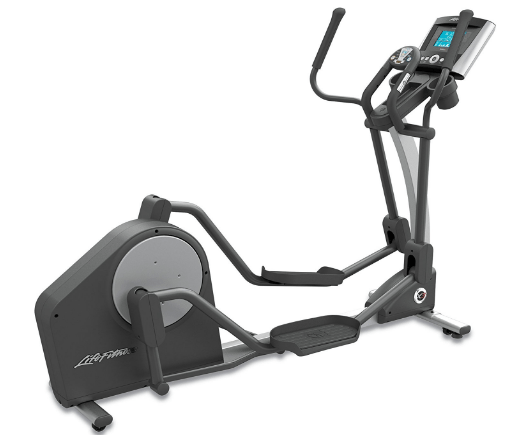 1 What kind of Machines are Elliptical Cross-Trainers? 2.1 How big and heavy is the Life Fitness X3? 2.2 What type of flywheel and pedals does the X3 have? 2.3 What is the maximum user weight the X3 can take? 2.4 What are the two choices of consoles? 2.5 What are other features does the Life Fitness X3 have? 2.6 What safety features does the X3 have? 2.7 What warranty does the Life Fitness X3 come with? 2.8 Where can I buy the Life Fitness X3 Elliptical Trainer? What kind of Machines are Elliptical Cross-Trainers? As we know, this type of trainer is a cross between the humble stair climber and a cross country ski exercise machine. All the benefits of those excellent machines in one, space-saving unit. Well, when we say space saving, at least less space than two separate ones! These machines still take up a fair bit of your home averaging around 6 foot long by 2.5 feet wide. Don’t forget the height you will need as well, as the pedals on the low point on these measures up to 15 inches off the floor. You will be stood up, so you need to add on your own height plus a bit more to get the minimum ceiling height. They are also quite heavy, usually around 150-250 lbs so bear that in mind if you need to carry it up the stairs. Some models come with wheels at one or both ends so that you can move them around. The main components of an elliptical trainer are the flywheel, resistance device, pedals and moving handles. Smaller fixed handles plus some type of console complete the picture. The flywheel could be at the front or the back and connects to the pedals and moving handles so everything works together. The pedals move in a flattened circle or ellipse shape to simulate the natural way you walk or run. You also pull and push on the handles as you are moving so that you exercise your whole body with one workout. The resistance device makes it easier or harder to move the flywheel around which provides many levels of exercise. Some models also allow you adjust the pattern of the pedal movement so that you feel as if you are walking or running up an incline. Using the console, you can set the different levels of resistance via some sort of screen and/or buttons. Often, the trainer will come with several basic exercise programs built in to make it simple to use. 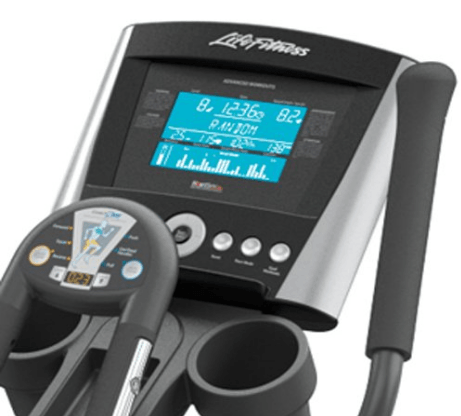 As you move up the scale of elliptical trainers, the console becomes more sophisticated. You will begin to see things like more programs to choose from and personalized workouts. Higher end models often come with the ability to connect to a fitness tracker on your phone or another device. They may even connect to the internet directly, allowing you to store your exercise history in the cloud. These top models will also sometimes come with a heart rate monitor of some kind to use with the built-in programs. This could either be through probes you attach to your chest or through sensors in the hand grips. Other luxury items you will find include MP3 players, USB ports and drinks holders. Everything it seems except someone to do the exercise for you! Last but not least many ellipticals often have some safety features to stop them damaging little hands and fingers. Most will not move without being turned on but just to be safe, always supervise young children if you are not able to shut your trainer away when not in use. 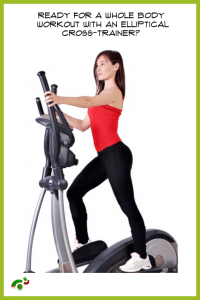 The beauty of elliptical trainers is that they offer completely impact free exercise. Everything should work in a fluid motion with no jerkiness or harsh movements. This is what makes them so popular for everyone, young and old alike. Even the partially infirm can use these trainers to get as much exercise as they need. Now that we know all the things to look for on a typical elliptical cross trainer, let’s check out the Life Fitness X3 to see how it stacks up. Life Fitness are well known for their commercial grade machines gracing the floors of many gyms and studios. The quality, precision, and technology used there has now found its way into their home use models. The Life X3 is a high-end machine that is extremely well built and comes with quite a few cool features as you would expect. The X3 is the mid-level unit in their X series models that also includes the X1 and the X5. This series features patented technology such as WhisperStride for near silent workouts and CoachZone to easily target specific muscle groups. There are also two console options and a few other features that make this model stand out from the crowd. How big and heavy is the Life Fitness X3? The Life Fitness X3 is probably one of the heavier elliptical trainers out there weighing in at 215lb. It does, however, have transport wheels so that it can be moved around fairly easily once in place. This model has the flywheel at the rear which makes it longer than a front mounted unit. It measures 87″ long by 30″ wide and 59″ high. The step-up height (how high the pedal is off the floor at its lowest point) is one of the lowest around at just 7″. This makes it easy to mount even if you are restricted in movement. Make sure you have somewhere with enough unrestricted space around it as your arms will naturally flex outwards as you use it. The owner’s manual recommends a safe distance of 12″ in each direction. The frame is made from commercial grade steel and will last a lifetime. What type of flywheel and pedals does the X3 have? As mentioned above, the flywheel on the X3 is at the rear of the machine. This allows the trainer to provide a ‘smooth and natural feeling workout’ according to the company blurb. Well, according to several reviews on Amazon this is definitely the case. No doubt helped by the WhisperStride technology used on this model. This patented feature is one of those actually worth putting a fancy name on, as it means the machine is virtually silent in operation. That is, apart from the huffing and puffing of the person using it! Cushioned, oversized non-slip pedals add to the positive experience of using the Life X3. These ensure anyone will be able to fit, no matter how large their feet. The pedals are fixed on long pedal arms between the flywheel and moving handles which also helps keep the ride smooth and quiet. They provide a fixed stride length of 20 inches, which is fine for most people. If you need a model that allows you to change the stride length take a look at the next model in the series, the Life Fitness E5 Elliptical Trainer. Note that there is no incline adjustment on X3 Elliptical Trainer. What is the maximum user weight the X3 can take? This model can be used by anyone weighing up to 350lbs. When evaluating an elliptical trainer, it’s always safest to make sure it can handle your current weight. This will prevent the mechanics of the trainer getting overloaded. What are the two choices of consoles? You can buy the X3 with either the standard Go console or the more advanced Track+ console. As you might expect, there is a price difference between the two of around $300 at the time of writing. The Go Console provides 12 essential workouts together with 2 custom workouts and 2 user profiles. The console is a stylish black color with an easy to read blue LCD screen. The Track+ console provides 14 essential workouts, 12 custom workouts, and 4 user profiles. It can also connect to Android and Apple devices for real-time fitness tracking. There are special mounts for both phones and tablets built into the console. You also have the convenience of a USB port to upload data and create a workout with the LF Connect website. The Track+ console comes in the same stylish black with a blue LCD screen. 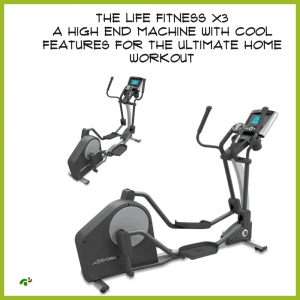 What are other features does the Life Fitness X3 have? The X3 comes with heart rate sensors built into the static handlebars underneath the console. These are used just to check your heart rate periodically through the workout. If you want to use the series of heart-related exercises built into the trainer console, then you will need to use something else. Luckily, Life Fitness have thought of that and included a wireless chest strap as standard equipment. Just underneath the main console on its own fitting, you will find the CoachZone panel. This little device allows you to enhance the basic workouts by targeting specific muscle groups. You can also use it to manually change the resistance at any point. Talking about resistance, this is controlled by a high-quality magnetic brake using an eddy current system. This brake system provides a wide range of accurate settings and completely silent operation. If you have ever heard an air resistance type system used on cheaper machines, you will appreciate just how brilliant this is. The hand grips on the X3 Elliptical Trainer are ergonomically designed, both on the moving handles and the fixed one. This makes them very comfortable to hold for long workout sessions. Finally, there are two cup or bottle holders, one on each side and a large central tray for keys, coins, and other personal effects. What safety features does the X3 have? Due to the completely enclosed flywheel assembly, fixed pedals and covered joints, this machine is as safe as an elliptical trainer can be. Especially when considering the dangers of an exposed air resistance system and young children. The console will also go into Safety Mode after 1 minute 30 seconds of inactivity. This prevents the trainer from working unless the ‘Enter’ button is pressed. As always, it’s safest to make sure children are not near the trainer when in use and are supervised around it when not. What warranty does the Life Fitness X3 come with? The standard warranty is 3 years for parts and 1 year on labor. That means Life Fitness will cover any defective parts for 3 years and also will cover the labor for fitting those parts for 1 year. The manufacturer also offers extended warranties on both parts and labor at an extra cost. The frame is covered by a lifetime warranty. Where can I buy the Life Fitness X3 Elliptical Trainer? If you live in the US or Canada, we recommend you buy directly from Life Fitness as they provide a great service. Their delivery cost includes assembly and installation plus cleaning up any waste in the location of your choice. Another option is to check out Amazon, as they often have discounted prices and shipping rates. You will need to check if delivery includes installation though as this can vary by seller. Outside of the US, check your country specific Life Fitness website for suppliers or your local Amazon site. The Life Fitness X3 is definitely worth the premium price you may have to pay for it. If you have the budget, then this trainer has everything you need, particularly if you go for the Track+ console. The only minor downside is that you are not able to adjust the pedals for a different stride length. In practice, that is not usually a problem as a 20″ stride is average for most people. We have found one or two concerns over the reliability of the magnetic brake over a long period of time. These have usually been dealt with by Life Fitness under warranty and seem isolated cases. Most reviews are positive and users love the very smooth and almost silent ride. The range of exercise programs that come as standard, even on the lower priced Go console machine cover everything you would need. The heart rate tracking functions included also provide a lot of flexibility. Coupled with the specific heart workout programs the X3 trainer is a great trainer to build up your cardio fitness. All this and the commercial grade durability of the product, make it unlikely you will regret buying this elliptical trainer. We hope you found this article useful in deciding if the X3 Elliptical Cross Trainer is for you. If you decide to buy one, don’t forget to check out the Life Fitness or Amazon websites for the best deals.